Irish Coat of Arms Print Plaque in a two tone wood frame. When you select a name that requires an apostrophe, such as O’Shea, from the drop down menu, you will notice that the apostrophe has been omitted. Do not worry; the selected name will be spelled correctly on the Irish coat of arms plaque with the apostrophe included when required. 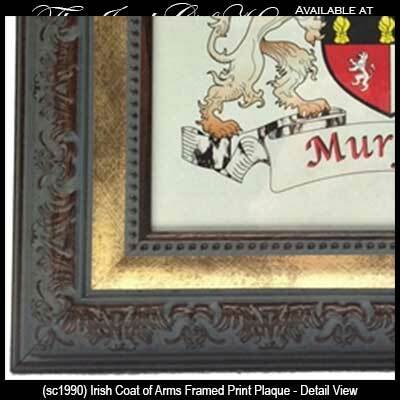 This Irish Coat of Arms Print Plaque features a two tone frame that features both gold tone and dark wood in an antique style. 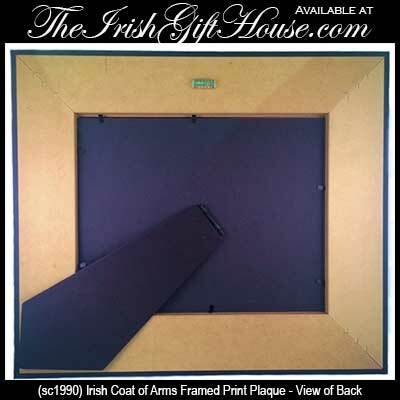 The frame holds a high-quality print of your Irish family coat of arms on fine paper and features a glass cover, easel backing and wall hanging hook. The Irish Coat of Arms print measures 10" wide x 8" tall and the overall size is 15" wide x 13" tall. Choose from over 900 Irish names. Allow 2 Week Delivery Time. Made in USA. Irish Coat of Arms Framed Print with a mahogany finish. This Irish Coat of Arms is matted and suitable for framing.